Bank Negara Governor Tan Sri Dr Zeti Akhtar Aziz has helmed the central bank for 16 years. For every criticism levelled at her, there will always be stamps of approvals, judging from the international recognition she has received as a central banker. 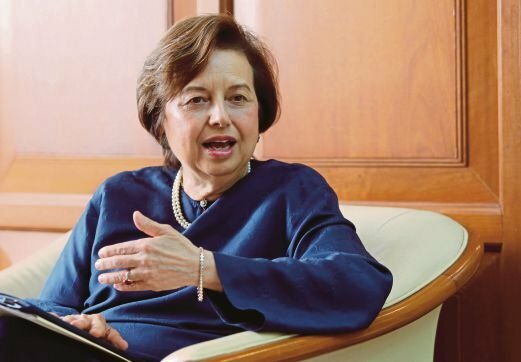 IN slightly more than a month, someone else may well be signing on our ringgit notes, a duty that for the past 16 years had been shouldered by outgoing Bank Negara Governor Tan Sri Dr Zeti Akhtar Aziz. That signature, which puts a value as legal tender to what otherwise would just be pieces of papers, perhaps symbolises the ultimate responsibility of the central bank’s governor as the value printed on the notes has to be supported by just about everything else that makes the nation. Writing a scorecard for Dr Zeti’s 16 years of helming the central bank will probably not be an exercise of objectivity. For every criticism levelled against her, there will always be stamps of approvals, judging from the international recognition she has received as a central banker. Perhaps, it would be enough just to say that she has done her job. Moreover, all of Malaysia’s central bank governors have preferred to stay out of the limelight. They don’t need accolades or any glorification. Someone once remarked that a Malaysian central bank governor is only a public figure within the grounds of Bank Negara. Quite like judges, they keep their private lives as far away as possible from public eyes. In my years as a journalist, a central banker has proven to be some of the people most difficult to extract information from. I could extract information from ministers a lot easier than from central bank governors I have covered as a journalist. Even when they speak to the press, central bankers tend to provide answers which were open to various interpretations. “We will continue to maintain an interest rate policy that is supportive of growth,” was the standard answer given whenever a journalist asked a Bank Negara governor of the direction of the interest rate. In the journalism profession, such answers don’t make good stories. They shunned press interviews, too, and even on the rare occasion that they grant one, the interviews would always follow scripts that were provided weeks in advance. The job requires them to be personalities who keep their cards close to their chests. As custodian of the nation’s finances, anything they say can be construed as policy and ultimately may have wide influence on the markets and sentiment. Almost always, a central bank governor is also someone who knows a lot about money, from its printing, circulation and most importantly, how to manage them. Needless to say, thus, integrity must be one of the primary requisites of a central banker. Much has been said about the tight-fisted former Bank Negara governor, the late Tun Ismail Mohamed Ali, whom for many was the benchmark for integrity. Whether it was a tale or otherwise, it was always pleasing to be told a story of how Ismail chased away workers who came in to beautify his office upon him being appointed as governor, telling them not a single sen of taxpayers’ money will be spent unnecessarily. It was said that Ismail carried the traits even upon retiring and while serving as chairman of conglomerate Sime Darby, where he would be driven in a company car only for official duties and used his own to attend to personal matters. I remember Ismail’s successor, the late Tan Sri Jaffar Hussein’s deep voice well. He, too, was a rather private individual. He was someone who was, according to his contemporaries, protective of his charges. When Tan Sri Nor Mohamed Yakcop volunteered to go to a then volatile Teheran to sign the palm oil credit and payment arrangement with Iran, Jaffar objected vehemently, saying Nor Mohamed could get killed. It was only after Nor Mohamed reasoned out that he could get killed crossing the street in front of Bank Negara did Jaffar allow him to fly to Teheran where he signed the agreement in a bunker while fighting was raging on the streets. Tales aside, what then awaits the incoming Bank Negara governor? One thing comes to mind immediately, where in a world that has changed tremendously, especially post Second World War, the advancement of technology, plus the fact that the market has emerged victorious in the end, the role of a central bank, too, has expanded far beyond its traditional duties of maintaining price and financial stability and as the lender of last resort. While maintaining order in the financial system, it also has to keep pace with the markets, primarily to maintain a policy that is balanced between preserving the system and encouraging growth. And, indeed, the global financial system and the economy in general are evolving even as I am writing this. Without going into dry technical issues, such as setting interest rates, liquidity and national debt management and inflation targets, even central banks’ stance in supervision of the banking system is dynamic. There was a time not too long ago when central banks would prefer banks to say “no” more often to risks presented to them. These days, they compel banks to strengthen their capitals and say “yes” more often. In their own ways, every one of our central bankers had performed their roles as expected of them. Granted that some have attracted controversies, but right from Ismail (1967-1981); Tan Sri Abdul Aziz Taha (1981-1986); Jaffar (1986-1995); Tan Sri Ahmad Mohd Don (1995-1998); and Tan Sri Ali Abul Hassan Sulaiman (1999) to Zeti (2000-present), they were largely responsible, albeit, quietly, in preparing the nation’s financial landscape from the days of Malaysia being an agricultural economy to an industrialised nation that it is now. We hope our future central bankers will continue to do so.